Hello again adventurers! It’s Patrick Poage, environment artist for Neverwinter. Last time we met I was showing off the Barovia zone that we released as part of the Ravenloft module. Today, I’m going into detail about art development for the Expeditions feature we are releasing as part of Neverwinter: Undermountain. Content Designer Ryan Horn will have another blog about Expeditions soon that goes into more detail, but the short version is this: Expeditions are repeatable adventures where players delve into Undermountain, searching for treasure and rare rewards while battling an unpredictable assortment of monsters and villains. We had a few specific goals that we wanted to accomplish for Expeditions. We wanted repeatable content, we wanted it to feel like you’re traveling far and wide across Undermountain, and we wanted to give it as much variety as we could given a team-size of only two developers. On the art side, I was focused on creating variety in two main ways, by changing the overall mood of the environment and by changing the path that players would take on their trek through Undermountain. There were a number of challenges we encountered along the way, but in the end I am proud of the places we created and I really hope that you enjoy them on your trek to 80 and beyond! Expeditions can get pretty weird. But hey, it’s Undermountain. Weird is normal there. Creating the mood for a new environment is one of my favorite things to do as an environment artist. The first thing I do is work with content to “paint a word picture” of what the space will look like. Descriptive language helps us visualize the end result and guides our process along the way. Next I focus on the three aspects of an environment that help establish mood: color, light, and atmosphere. For Expeditions, we wanted to create multiple different moods so that each time players go on an expedition it will feel fresh. This meant creating different combinations of colors, lights, and atmospheres for players to experience. In the end, we settled on three different moods. The “Classic” mood was traditional torchlit corridors. The “Mushroom” mood was very colorful with groovy glowing mushrooms. And the “Shadowfell” mood was the Classic mood with a shadowfell twist. Lighting has perhaps the biggest impact on mood. The placement, intensity, and color of lights can utterly transform a space. The Classic and Shadowfell moods have almost the same lighting, until you cross over the threshold into the Shadowfell. The intensity of lights in that space is much greater, and in the distance, the ambient light fades into a gloomy nothingness. The Mushroom lighting scheme has lights coming from different places than the Classic, with smaller, more colorful glows helping to create a funkier, more organic feel to the space. [Use the slider bar on the left to compare the images] This is the same part of the map with different moods applied. By changing just color, light, and atmosphere we can create a very different feeling for the same spot. For color, we wanted the Classic mood to have complementary warm bright lights and soft blue backgrounds. This would contrast nicely against the Mushroom mood, which is full of vibrant neon shrooms and more of a split complementary color scheme. The Shadowfell mood is basically an overlay on the Classic, with bubbles of shadowfell where almost all color within is bleached from the environment. Atmosphere is last main ingredient I like to use to establish mood. When I talk about atmosphere, I mean a combination of things. Atmospheric particle fx like mushroom spores and shadowy figments definitely contribute. Fog and ambient lighting are also important. In the Cryptic engine, we use a “skyfile” system to adjust those features. Setting the fog to different intensities and colors has a big impact on any long vistas in the map, and the ambient world lighting can drastically change the feeling of a space. [Use the slider bar on the left to compare the images] In this image, all that has changed is the skyfile and some atmospheric fx. We leech the color from the scene with post-processing, pull the fog intensity up and change the distance it fades. The lights are in the same place, emitting the same color, at the same intensity, but the different atmosphere has totally changed the mood. The second way that we wanted to create variety for players was through changing the path that players take each time they run an expedition. With yours truly as the only environment artist working on the feature, we just didn’t have the time or manpower to make infinite maps. But by making clever decisions early on we were able to increase replayability so that things won’t feel stale for players. Overall, there are nine different “floors” that make up all the Expedition content. There are three “Rooms” floors, three “Corridor” floors, and three “Arena” floors. Each category has something special about it. Rooms floors are spread out spaces with multiple paths through where players have a variety of decisions to make. Should they go left or right, take the high road or the low road? Corridor floors are much more linear, forcing players to approach challenges head on and search the nooks and crannies along the way for rewards. Arena floors are also straightforward, with a small section at the start followed by a big space for an epic boss fight. When you start an expedition, we roll a random selection from these nine floors behind the scenes, with an arena floor always guaranteed at the end. This means players should expect something different nearly every time they run an expedition. Creating this variability in Expeditions didn’t come without its challenges. Two of the biggest problems I faced were the technical problems that came as a result of changing the mood without changing the environment. The first challenge was lighting the Expeditions. 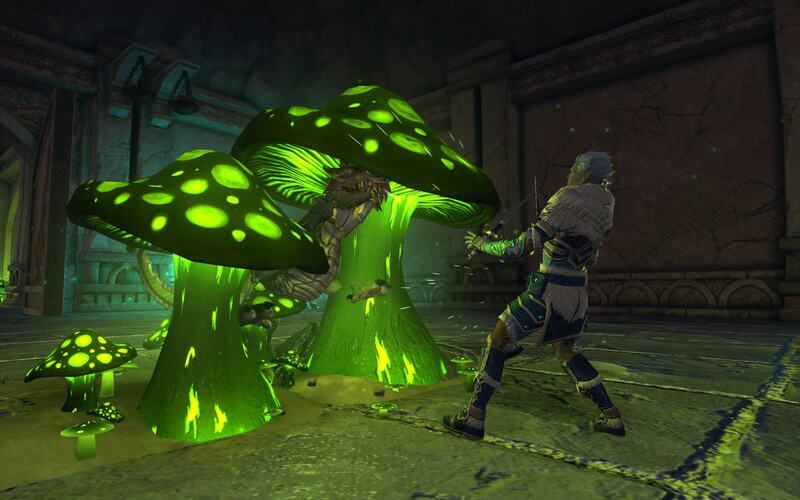 Neverwinter is almost six years old and its lighting engine is…old school in many ways. Any object in the environment can only be affected by a max of two dynamic environment lights. That means if I have two glowing mushrooms near a stalagmite, I can’t add another dynamic light without causing light seams to appear. [Use the slider bar on the left to compare the images] In this image, you can see some of the problems caused by having more than two dynamic lights. The image on the left is lit by two lights. The image on the right is lit by three. You can slide between the two to see the problem areas. In most maps, we can use a different type of light called a vertex light to help out. Vertex lights are less performant than dynamic lights and they tend to wash out details in the environment. But, they don’t count towards the two-light limit, so they are perfect in the right situation. Unfortunately, the effect of their light is baked into the geometry on the map, so the ever-changing moods of Expeditions weren’t able to support any vertex lights. That meant that sometimes I just couldn’t light spaces the way I wanted to. When I add lights to a scene, I like to have a good reason for each light. Does it help illuminate the playspace? Does it support the mood, or help guide the player to their goal? But for Expeditions I had the added question of, “Does it overlap with more than one other light?” It was a tricky limitation, but one that we were able to work around with perseverance and some creative thinking. The second problem didn’t show up until much later in development. 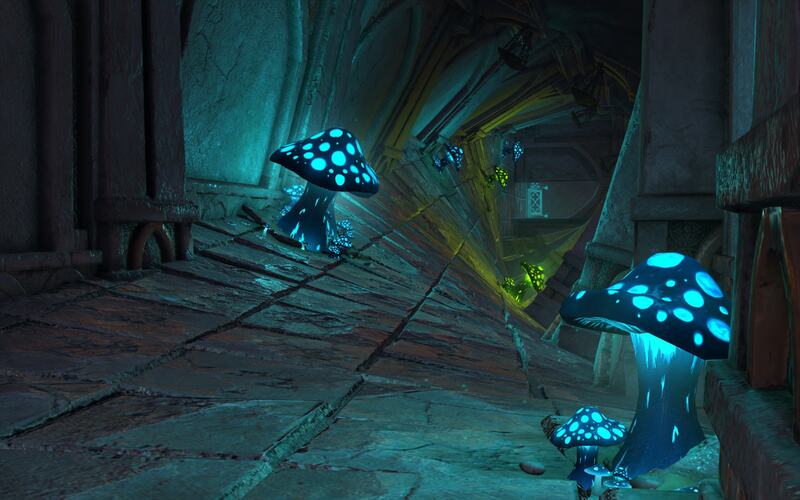 Originally, the majority of large mushroom props in the Mushroom mood didn’t appear in the other moods. It helped further differentiate each mood from one another. With large mushroom props only showing up for some of the playthroughs, players would occasionally be treated to different room layouts. After some heavy playtesting, however, it was discovered that dynamically hiding or showing the mushrooms caused big problems with our AI pathing system. Enemy critters would run right towards the player and then get stuck on the mushrooms, and players’ companions were notoriously bad about it, constantly running into shrooms and being unable to get out. We tried a few different workarounds, but in the end decided it was best to stop trying to “turn off” the mushrooms and just change their appearance in different moods. Rage Drakes aren’t normally happy fellas, but this one was especially frustrated at getting stuck in the mushroom. Overall, though, the development for Expeditions went pretty smoothly. Ryan and I spent a fair bit of time iterating on designs for adventurers to explore and then I got to work on the “do art” part of the module. By changing up the color, lights, and atmosphere we were able to get three distinct moods for the same environment. By creating nine different floors of three different archetypes, we created an experience that should feel different each time players run through. Despite the challenges we encountered with this new type of content, we were able to find workarounds and fixes to deliver something really fresh and fun to play. I hope that you all enjoy running Expeditions solo or with your friends when we launch on April 23rd. I’ll see you in game! PS – I am sad to say that this will be my last art developer blog for Neverwinter. I’ve worked with this team for four years creating places for adventurers like you to enjoy. As a huge D&D nerd, working on Neverwinter was really a dream come true. But soon I will be moving downstairs to help create even more magical environments for the Magic the Gathering MMO Cryptic is working on. It was an honor and a pleasure creating environments for you to explore. I hope that you never stop adventuring, and may all your rolls be natural 20s!